The U.S. Department of Labor’s (DOL's) Employment and Training Administration is now accepting applications for Workforce Innovation and Opportunity Act grants that promote evidence-based and evidence-informed interventions that have been shown to achieve successful employment outcomes for people involved in the criminal justice system, new interventions that theory or research suggests are promising, or a combination of both. Models must provide solutions to improving workforce outcomes for people involved in the criminal justice system located in high-crime, high-poverty communities. Applicants must have a clear framework for delivering services and accomplishing performance goals and measures identified by DOL. Applications are due by April 25. Many localities have in recent years regulated the use of questions about criminal history in hiring, or “banned the box.” This publication, from the American Enterprise Institute, shows that these regulations increased employment of residents in high-crime neighborhoods by up to 4 percent. This effect can be seen in both aggregate employment patterns for high-crime neighborhoods and in commuting patterns to workplace destinations with this type of ban. The increases are particularly large in the public sector and in lower-wage jobs. This is the first nationwide evidence that these policies do, indeed, increase employment opportunities in neighborhoods with many people who have criminal records. 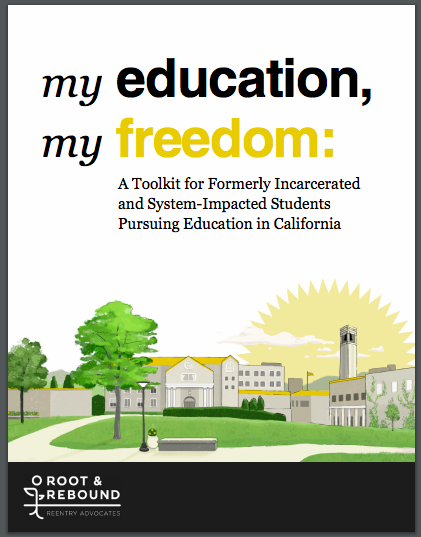 Students with criminal records in California face barriers to certain jobs and licensed occupations, are often told there are no financial or other resources for them, and may require extra social support in an educational landscape that often fails to reflect their lived experiences. This toolkit, from Root and Rebound, provides a roadmap for currently enrolled and potential students in California to develop their educational and career plans.